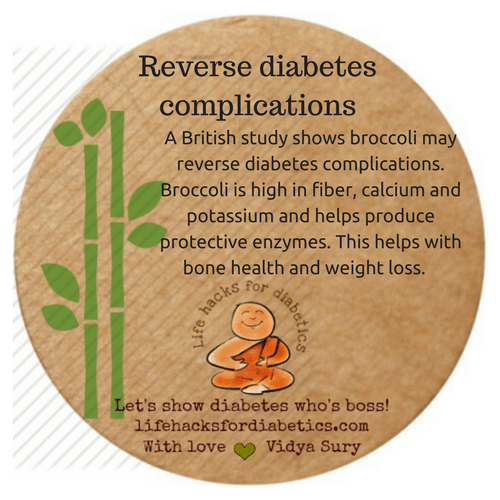 A British study shows that broccoli may reverse diabetes complications. Broccoli is high in fiber, calcium, and potassium and helps produce protective enzymes. This helps with bone health and weight loss. Vidya Sury loves her work as a writer, editor and blogger. On really busy days her time off is restricted to playing with her dust bunnies and celebrating the little things. She loves coffee, people, cooking, books, writing, photography, travel and social media - and showing her diabetes who's boss. Together, let’s show diabetes who’s boss! Let's show diabetes who's boss! This blog: Life Hacks for Diabetics, does NOT provide medical advice, diagnosis or treatment. The information here is purely for information purposes and NOT professional advice. Please consult your doctor for medical advice, diagnosis and treatment.